Astranga means ‘colorful sun set’. Astaranga is located near the mouth of the Devi River. It is about 60 kilometres east of the holy city Sri Jaganath Puri and lies on the Bay of Bengal coast. It is about 19 kilometres from Konark. One of the popular beach resorts of Odisha, Astaranga is situated at a distance of 75 kilometers from the capital Bhubaneswar. It lies on the coast of Bay of Bengal and is famous for the lovely and long sandy beach. It attracts lots of visitor to enjoy the natural scenery of the beach. The Sunset site of Astaranga beach is incredible for tourists. The geographical location of Astaranga is Latitude: 190 58' 60 N and Longitude: 860 16' 60 E. Astaranga is a combination of two words, 'Asta' and 'Ranga'. In oriya language 'Asta' means 'Sun set' and 'Ranga' means 'Colour', so 'Astaranga' combinely means 'Colourful Sunset'. Astaranga beach gives the visitors, the right frame of mind to visualize the wonders of nature. Here visitors can have an panaromic view of the horizon which becomes uncommonly colourful during sunset, justifying its name as 'colourful sunset'. 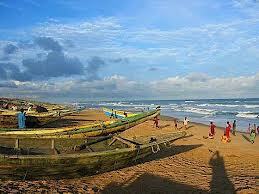 Astaranga is also a famous fishing center of Puri. The small market sits here on the beach where the fishermen sell out their catches to the waiting vendors. The crowd in the early morning consisting of the boatmen returning with their nets from the sea and the intending buyers give a perfect picture of man's co-existence with nature. The best time to visit Astaranga beach is during October to June. It is well connected and easily accessible by motor able roads and railway tracks. The nearest airport is Biju Patnaik Airport at Bhubaneswar.